The latest Michelin Guide is out and features seven starred restaurants in Turin, testifying to the region’s reputation for enogastronomic excellence. The Casa Vicina restaurant housed within Eataly is not run by a chef, but by the Vicina family, who for five generations have embraced the region’s tradition of hospitality, fine wines and traditional cuisine, infused with prime quality ingredients and reinterpreted with an innovative twist. Their rabbit, of the ‘grey Carmagnola’ species, is sourced from Slow Food Presidia, while their candied fruit, bread (made with sourdough), sausage, grissini, jams and gianduia spread are all homemade, using locally-sourced ingredients. Among its signature dishes, its liquid Bagna Caôda: the vegetables, boiled and blended with a drizzle of olive oil and the ”bagna caôda”, are arranged in layers and served in a Martini glass. 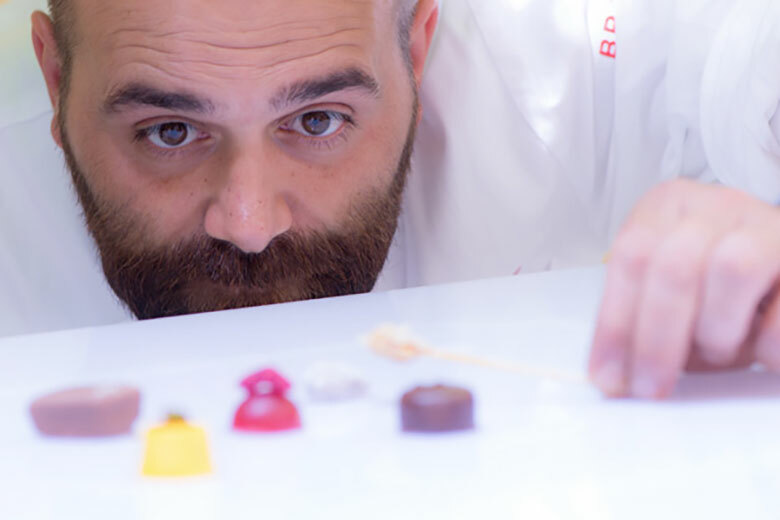 Other standouts include Tonno di coniglio and Giardiniera in agrodolce, a creative combination of two traditional Piedmontese antipasti, and Cri Cri, a reinterpretation of the typical Torinese bonbon which is covered with coloured sprinkles and filled with a hazelnut and chocolate paste. The wine list is extensive and well structured. The area of Piazza Carignano is home to the Del Cambio restaurant, an icon of the Italian Risorgimento. Established in 1757, it was among the favourite haunts of Camillo Benso, Count of Cavour, Giacomo Casanova, Honoré de Balzac, Giuseppe Verdi, Eleonora Duse, Maria Callas and the Agnelli family. This restaurant is a real Torinese institution, and was revamped and awarded a Michelin star, following the arrival of Matteo Baronetto. The historic dining room, with its frescoes and crystal chandeliers, still hosts Cavour’s table. The second dining room is through a grand passageway, paneled in artwork by renowned artist Michelangelo Pistoletto, while the upper spaces host Bar Cavour, where you can enjoy a selection of fabulous cocktails before or after dinner. 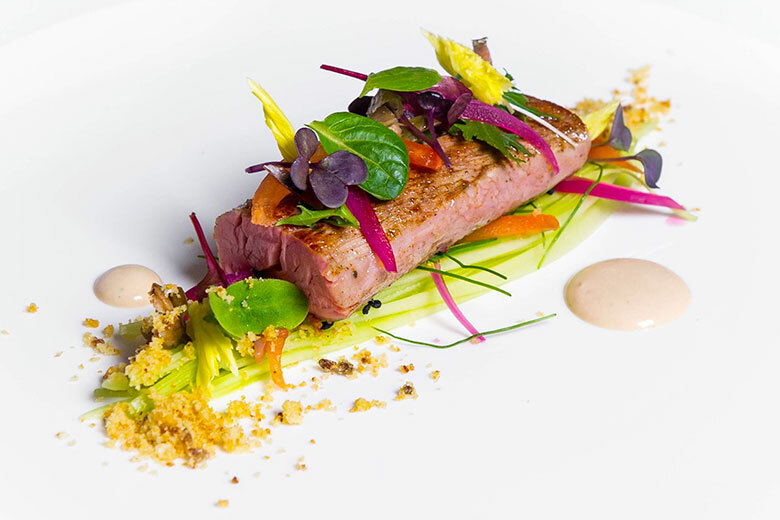 Baronetto, of Piedmontese origin, remains true to regional traditions, which he reinterprets with a creative twist including his now famous ‘Nel tempo’ menu featuring the historic dish. A tour of the cellar, whose 17th century aisles house 2,200 labels, is also worth a visit. In addition to the most famous and hard to find Piedmont producers, it also has an impressive selection of wines from other parts of the world. You can also drop in for a light lunch or afternoon tea at the Farmacia Del Cambio, an old pharmacy turned pastry shop and café, which still retains its exquisite wood paneling and ancient ceramic spice vases. Here you can taste and purchase an assortment of delectable pastries and baked goods created exclusively by chef pâtissier Fabrizio Galla and produced by Del Cambio. In Vanchiglia, one of Turin’s most historic districts, that has been completely transformed, you’ll find Magorabin, amidst historic ‘botteghe’, avant-garde art and trendy locales. Just steps from the Mole, this starred restaurant is owned by Marcello Trentini, an eclectic Chef with a strong personality, who demonstrates his creativity with a menu featuring dishes like Prawns, Brains and Datterini tomatoes or Sea bass, artichokes and bagna caoda, in addition to the dishes that have made him famous like Spaghetti, bread, butter and anchovies or Pheasant Plin. You can dine à la carte, or enjoy the restaurant’s tasting menu. There’s also a ‘social table’ for those who love food, wine and good company. If you’re only passing through Turin, or staying far from the restaurant, Magorabin offers a chauffeured limousine service that will collect you and take you back to your hotel or directly to the airport. If the restaurant’s booked out or you don’t have time for a full-course dinner, but would like to sample Trentini’s delights, remember that just a little further on, in the same street, the chef has opened Magorabin Alimentari, a bottega/bistro with an adjacent bakery where, you can purchase speciality products or stop and savour their bread, cocktails and a few dishes prepared by Magorabin’s chefs. In piazza Solferino, one of the city’s busiest, most central squares, you’ll find Vintage 1997. If you’re not a fan of the modern, minimalist settings that distinguish the majority of today’s contemporary fine-dining establishments, then this is the place for you. The restaurant’s culinary offerings are also true to tradition. 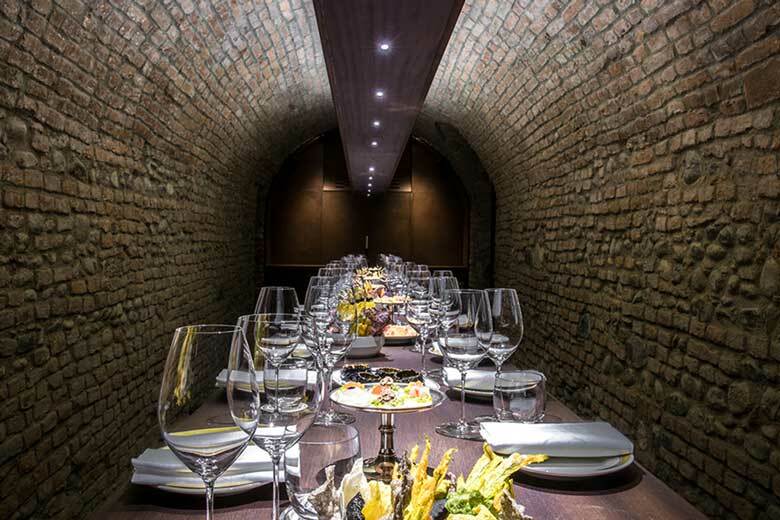 Rather than bold, creative pairings, you’ll find authentic Piedmontese specialities including truffles, cheeses and meats (cooked or raw), prepared with the respect and consideration that they deserve. No-frills expertise practised for the past twenty years with traditional Piedmontese professionalism. Standouts include tajerin, agnolotti di gallina, and the so-called ‘Torinese’, a Fassona beef cutlet breaded with hazelnuts and grissini. The menu also features creative versions of southern dishes including seafood platters or homemade scialatielli. Desserts are based on the classics of Piedmontese tradition with bunet, zabaglione, tiramisu and tortini al cioccolato (chocolate cupcakes). The wine list comprises classic Piedmont labels and their French counterparts, with an assortment of champagnes, national vintages, and a few forays into other countries. Special menus for vegans are also available. Spazio 7 is the restaurant housed in Fondazione Sandretto Re Rebaudengo, a centre for contemporary art located in the San Paolo district in a former industrial warehouse. The dining room is an integral part of the Foundation. 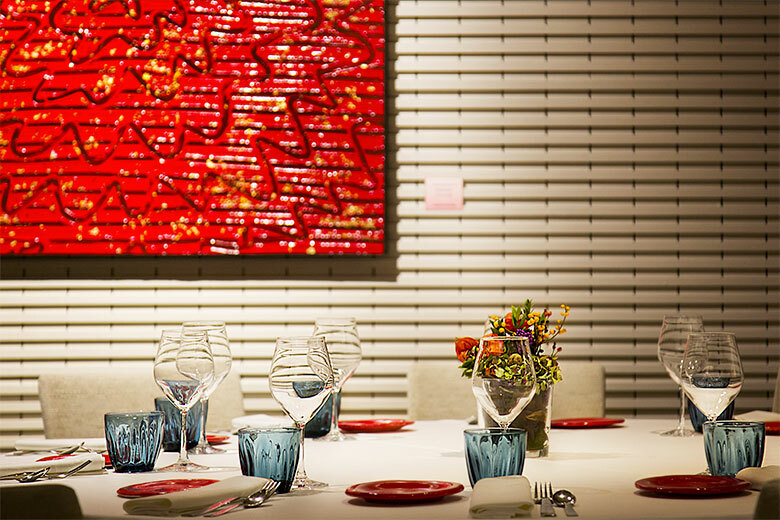 Its walls are decorated with site-specific works and its tables feature artistic creations. The cuisine offered by Alessandro Mecca, a young Chef who arrived here after working at several of Piedmont’s most historic restaurants, mirrors the foundation’s concept: young, contemporary and open to innovation. Not surprisingly, the menu, which suggests various tasting options, features dishes resembling works of art. Thus, amidst spheres, dried fruit, and Pollock-style sauces, pairings that initially appear to be rather daring, are actually perfectly matched. There are also more classical dishes like Carpaccio di vitella, similar to a veal scallop with a butter sauce, or Agnolotti with a sage and butter sauce. When it comes to desserts, the chef combines sweet, acidic and salty flavours to create mouthwatering treats like Figs and buffalo milk, or Carob, pears and seirass (a type of typical Piedmontese ricotta). The wine list features the classics of Piedmont and its neighbouring regions in France, with a particular focus on small producers and some examples from the world of natural wines. Located just steps from the Church of the Gran Madre di Dio , you’ll find the Cannavacciuolo Bistrot Torino, the latest Michelin-starred locale owned by renowned chef Antonino Cannavacciuolo. This restaurant highlights the essence of the famous Neapolitan chef Antonino Cannavacciuolo’s culinary art, which sees traditional ingredients from his homeland mixed and matched with those from Piedmont. The bistro’s menu features light, high-quality offerings that pay tribute to Piedmont, the adopted home of the chef. The menu, which changes on a seasonal basis, features the great classics of regional cuisine subtly re-imagined with an innovative twist. 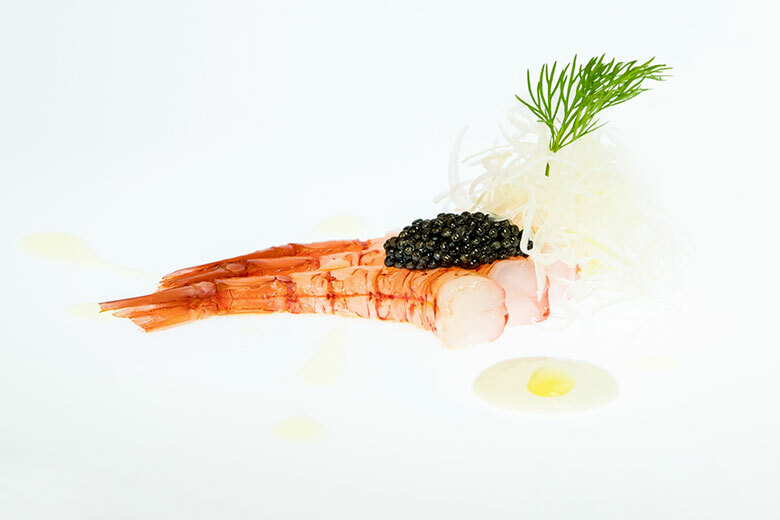 Signature dishes include Tonno vitellato with a bottarga (fish roe) mayonnaise, Tagliatelle with shrimp and brains and, for dessert, Bonèt and raspberries. In addition to great food, throughout the seasons, the bistro’s menu is enhanced by an extensive, well-chosen wine list. The restaurant is located inside the Grand Hotel Sitea, just a stone’s throw from Piazza San Carlo. 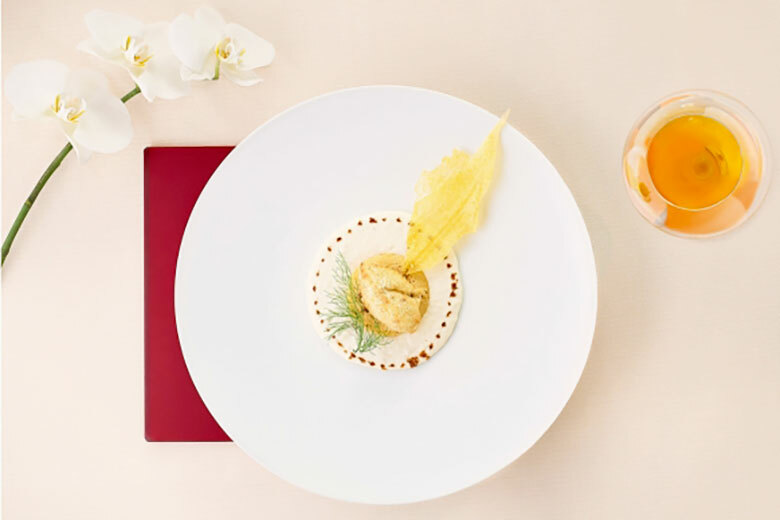 At the hotel’s restaurant, the culinary offerings are inspired by Piedmont’s renowned regional cuisine, re-imagined by Chef Fabrizio Tesse, a Milanese native, who prior to helming the kitchen at Ristorante Carignano worked at several starred restaurants in Piedmont, Liguria and Spain. At the Carignano, Tesse, assisted by wingman Marco Miglioli, offers a cuisine rooted in Piedmont tradition with a few forays into the nearby region of Liguria, highlighting numerous seafood offerings. 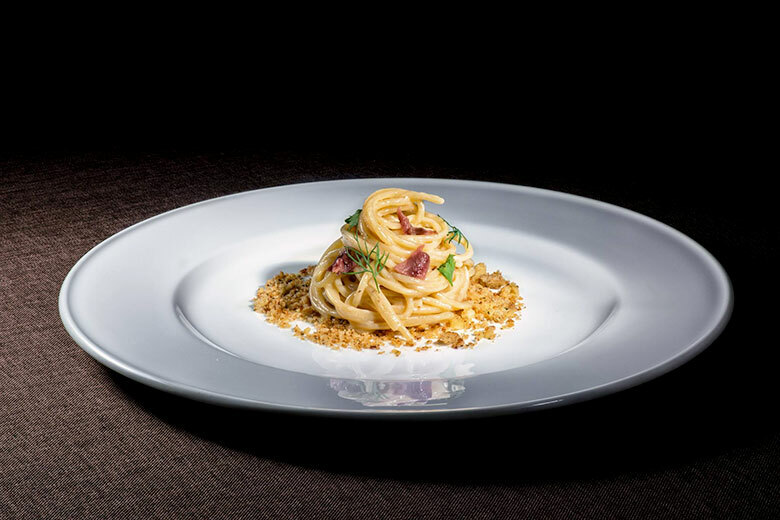 Standouts include his reinterpretation of Piedmont’s classic Agnolotti del plin paired with porcini mushrooms, shellfish and truffles, or his creative take on Rome’s traditional Spaghettone cacio e pepe, which he enhances with Piedmont’s famous Bra sausage. 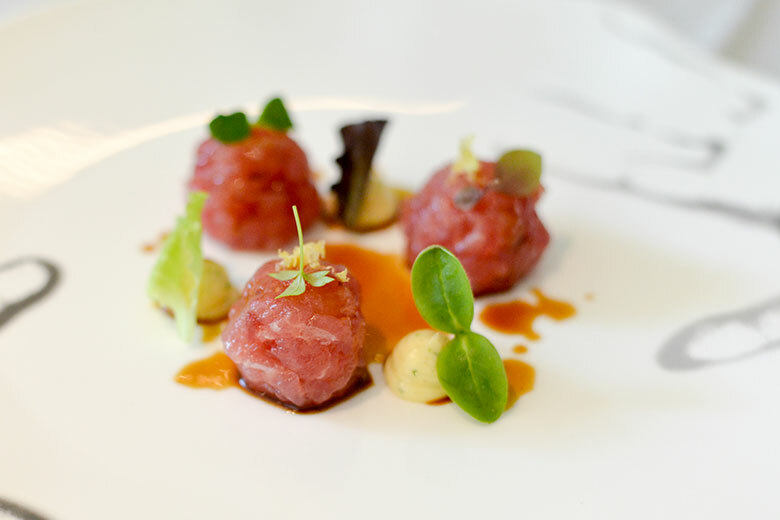 Other creative highlights include the chef’s Animella tonnata, featuring sweetbreads instead of the more classic veal. The dessert menu also boasts several innovative touches. Regional classics like gianduia, peaches and tiramisù are revamped with fresh, contemporary ingredients including citrus fruits, ginger and licorice.